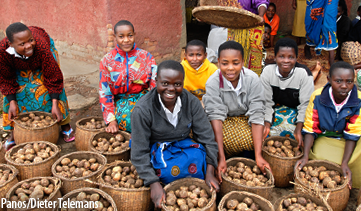 There is a wide range of policy and program tools and strategies for addressing hunger and under­nutrition. But determining exactly what steps to take, and when, to accelerate progress is complex. To help determine those steps, Compact2025 organized roundtable discussions in each focal country. The overall objective of the roundtables was to set the critical groundwork for assessing how to end hunger and undernutrition in each country by 2025. The roundtables aimed to identify key knowledge gaps, opportunities, potential synergies and priority areas for research, policy actions and investment. The roundtable discussions also served as an opportunity to convene a range of key actors across the many sectors relevant to achieving food security and nutrition. 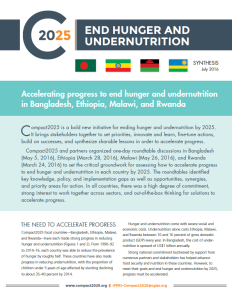 These discussions served as a starting point and foundation for the development of practical action plans for eliminating hunger and undernutrition in each country. A synthesis of outcomes from the four roundtable discussions has been developed and is available for download. Click below for more details and key documentation from each country’s roundtable discussion.